The Stinger is unavailable in this color. Pick another color to get on the water faster or join the wait list. Beginning with a prototype called the Remix 100, this project had a simple goal: develop a boat to win the Green Race. After five years of testing, redesigning, and expanding the concept, we have finally reached production for the quintessential high-performance creek racing kayak. We drew on the expertise of the top racers and a well-rounded design team led by Shane Benedict to bring the public a fast, responsive, and easy-to-paddle boat. Each year the team has honed the Stinger to enhance the turning, surfacing, and speed. Since the initial design, we have added 8" to the stern so it rides forward and aggressive, skipping through holes where other boats bog down. The shorter bow keeps it from pitoning in steeper drops, and the high-crowned deck helps the boat surface rapidly. At this time, the Stinger holds course records in extreme races across the country; at home on the Green River, its record in the last 5 years is unparalleled. Now that we have completed the final model, the Stinger stands out among other boats for its dramatic ability to come out of rapids at top speed. The extra length of the stern allows the boat to plane-out quickly and hit its insanely fast top-end speed while it plows over almost any obstacle with just the right amount of bow rocker. It has the ability to dominate races plus is incredibly fun to paddle on all types of water simply because it is fast. The sensation you get sitting when in the cockpit while motoring down a river, wiggling and bouncing off eddy lines, coming up on a slot to straighten your charc and seeing the bow fly past the rock you barely missed, maintaining a glide for longer than you thought possible; well, these impressions, these thrills are the joys of speed. You do not need to be a racer or have any desire to compete to love the exhilaration of paddling a long boat. 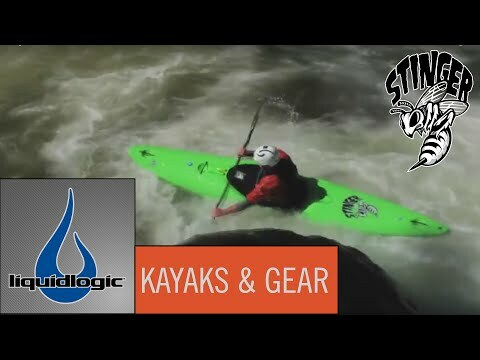 Whether your goal is to win races or to spice up your local run, to do attainments, or just to rip down creeks and rivers like there is no tomorrow, whatever class you are on, you'll find the sensation of the Stinger's speed as addicting as it is fun. If your inseam is less than 32 inches, consider getting a FREE Blukhead Plate at checkout by adding the model specific B-Plate to your cart and using code FREEBPLATE. The larger B-Plate will replace the stock B-Plate giving you a better fit in your kayak. The B-Plate can be found under the Parts section in our online store. How does the Stinger compare to other long boats on the market? Simply put, it is faster. If you are looking for a boat to win a race or just move quickly down river, the Stinger is it. Period. The Stinger is a proven race winner with big wins at the Green Race, Great Falls Race, KONY Races, etc.